The TV industry has traditionally relied on advertising and subscription fees for revenue. Recently, brand extensions and co-branding strategies have been rediscovered as income sources. A prominent example of such a strategy is the TV format Dragons’ Den, which has been locally produced in many different countries. We use this intriguing case to explore the extensive and intricate co-branding relationships and brand extensions in the business-to-consumer and the business-to-business settings of TV companies. Our paper analyses global adaptations and cultural branding of Dragons’ Den; in particular, brand extensions and co-branding strategies. TV format brands are significant in the international media business, as they are very applicable for international trading activities. Many authors have studied the differences between local productions of a global brand and those of the original programme format and the markets of its local adaptations.3 Much of the focus lies on the study of the cultural reasons behind localization efforts. More recently audience analyses have received a lot of attention. There is however, a lack of research that studies the relationships within the often complex brand architectures surrounding TV formats that find their expressions in brand extensions and co-branding. While several authors, e.g. Rohn or Singh and Oliver, discuss international brand extensions, co-branding practices are a neglected field when studying international format trade, although they are of increasing relevance for branding strategies.4 The aim of this explorative case study into the widely sold and internationally adapted format Dragon’s Den therefore is to investigate local manifestations of brand extensions and, in particular, co-branding practices of international TV formats. The case study is to serve as a stimulus and starting point for more extensive research into other international TV formats. The next section introduces the case of Dragon’s Den and describes the setting of TV formats as brands and the actors involved in the various localised branding activities. The extent to which a production consists of locally adapted versus internationally standardized elements is often the result of negotiations between the local producer and the format holder. One of the main reasons for localization efforts is the difference between the culture of the format’s origin and the culture of the target audience. The ‘Vertical Barrier Chain’15 distinguishes and emphasizes regulatory, political, and economic factors that may influence the extent to which programmes are localized. Economic factors may lie both within the target market as well as within the local production companies. In terms of the differences between the original format and its local adaptations regarding Dragons’ Den, it should be noted that the local versions are based on the format’s U.K. version rather than the original Japanese. Multiple local adaptations of the U.K. version make Dragons’ Den more culturally proximate to the respective audiences; these alterations include, most obviously, the name of the show, the colour design of the studio, and the composition of the jury panel. The most popular names for the show regardless of location are Dragons’ Den as the show is called in the U.K., Canada, Ireland, and Poland, Shark Tank as the show is called in the U.S., Australia, and Portugal, or Lions’ Den as it is called in Germany, Denmark, and Finland. In countries without English as the main language, the name of the show is usually a translated version of one of these titles. With a few exceptions, such as in Austria (where the show is called 2 Minutes, 2 Million) and the Czech Republic (where the show is called D-Day) the name of the show always refers to an animal. This can be traced back to the original programme from Japan, which was called Money Tigers. The reason behind these name adaptations most likely stems from the associations that different cultures have with various animals or creatures such as sharks, dragons, lions, or tigers.16 What those animals all have in common, though, is that they are strong, smart, and dangerous. But while the lion spends much of its time within its social group resting and observing, and prefers to attack only when the opportunity presents itself, the general idea of sharks tends to be one of a solitary hunter that covers large distances in search for food. The particular choice of animal for the name of the show suggests conclusions about the role assigned to the panellists in the local adaptation. Related to the choice of animal is the studio design which differs across various local productions. While the panellists (i.e. the so-called ‘lions’) in the German version sit in a studio with warm colours and a bonfire atmosphere, the panellists (or ‘sharks’) in the U.S. sit in a studio with a much colder, tempered atmosphere where blue is the dominant colour of the show (see Figure 1). The key elements of the Dragons’ Den format are the panellists and the entrepreneurs who pitch their ideas. In all local versions, the panellists and entrepreneurs add some local flavour to the show. Very few panellists are part of more than one local version. However, Kevin O’Leary and Robert Herjavec have been panellists in both the U.S. and Canadian versions. In general, using locally-known panellists makes the programme more culturally proximate to audiences, and it helps to better advertise the show within its own market. Locally-chosen panellists may better represent personality traits that are highly valuable in a given culture. By comparing different local versions, it becomes obvious that panellists in the Anglo-Saxon versions, for example, have a cultural story that favours how someone with a poor background has managed to achieve entrepreneurial success and financial fortune. The choice of panellists in the German version, however, appears to be more motivated by communicating seemingly official authority, power, professionalism, or knowledgeability. In the 2015 season, two of the five panellists were politicians (members of parliaments), Vural Öger of the European Parliament and Lencke Steiner of the city-state parliament in Bremen. Thus, the very character or flavour of a local version of the Dragons’ Den depends on the selection of the panellists. The inclusion of local panellists aims at creating cultural proximity and avoiding cultural barriers, otherwise known as cultural Lacunae.17 Furthermore, the local panellists set the foundation for promotional activities in the context of achieving company-created Universals18. Because of this, the import of the originally foreign format of the show is more likely to be successful with local audiences if local producers and broadcasters manage to create a competitive advantage with this programme compared to other programmes in the market. In this context, locally chosen panellists may help to strategically position the production, as they may represent a crucial element in the marketing and promotional efforts of the programme. In fact, marketing and promotional efforts may actually help to adapt a format to the local market by overwriting possible cultural discrepancies in cross-cultural tastes between the culture of the format’s origin and the culture of the local audience. Simply speaking, where a show that originates in a foreign market does not perfectly suit the taste of the local audience, promotional efforts and brand communication may compensate for such discrepancies. Hence, being able to rely on brands is not only crucial for TV format holders in their quest to sell their formats in international markets, brands also play an important role in adapting those formats to local audiences. Like other reality TV formats that revolve around participants who perform in front of a panel, Dragons’ Den not only represents a global format and corresponding global brand, but the format of the show also enables and builds on a very complex architecture of various kinds of interrelated brands, which facilitate as well as support and promote each other. The panellists themselves operate as person brands and the products that compete for funding are product brands. The broadcasters and producers nurture their corporate and channel brands: each local version of the format is a brand itself that is then broadcast on a channel brand. Furthermore, various sponsors link their brands to Dragons’ Den including its panellists, the competing products, and the broadcasting channels. Dragons’ Den therefore serves as a perfect case study for examining branding practices in the context of contemporary international TV format trade. In the following, we will describe various co-branding and brand extension practices with Dragons’ Den productions in the U.K., the U.S., Canada (the English language version), and Germany. The question of what a brand extension is turns out to be much less distinctive in practice than is assumed in branding literature. ‘Brand extension’ is commonly defined as using an existing brand name on a new product,19 while ‘co-branding’ refers to a branding alliance between two or more different brands.20 Boundaries with co-branding are blurred, in particular, because the driving agents behind a specific branding process and their respective objectives may differ considerably, despite how similar they may appear at first sight. For example, dragons often publish books with a ‘why my business became so successful’ story, or a condensation of their advice on ‘creating a successful business for dummies.’ In the case of Höhle der Löwen, these publications were initiated and supported by the broadcaster (i.e. Vox)21, so this would be a brand extension. Contrarily, the book by Daymond John22 (U.S. Shark Tank) primarily promotes his own personal brand while only mentioning Shark Tank. Therefore, from the perspective of the TV format owners - Sony Pictures Television and ABC - this is a case of co-branding. For this article, we distinguish between brand extensions and co-brands via an extension being initiated and managed by the TV format holder versus (in the case of co-branding) the management of the brands being in different hands. The most common form of brand extensions are spin-offs of the original (local) format and special episodes. Notably, it takes about three seasons for a format to establish itself in a market in such a way that the introduction of a spin-off becomes feasible. Only after that stage is reached are spin-offs created, either to address special audiences or feature one or more of the dragons more prominently. 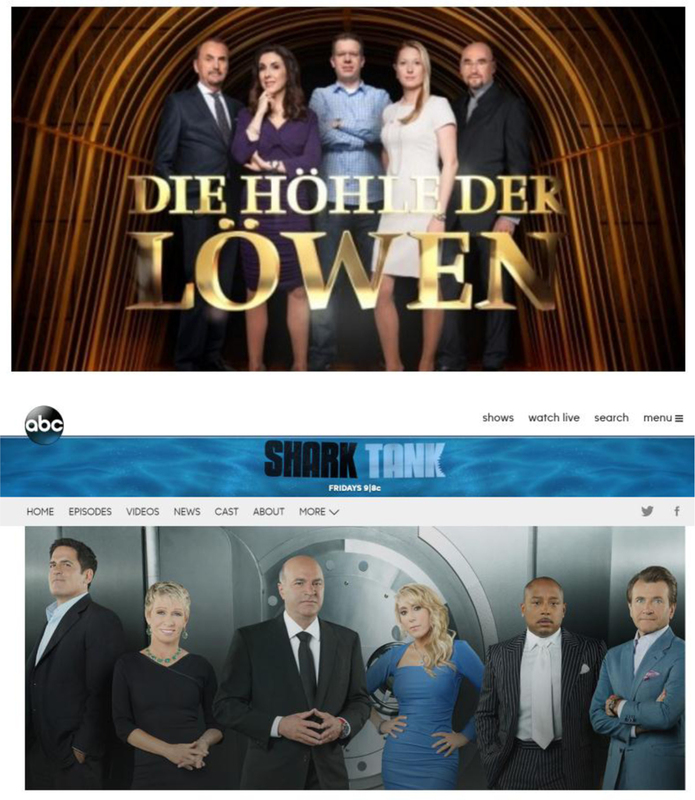 The German Höhle der Löwen has currently completed two seasons, and thus no spin-off has been launched yet. Dragons’ Den in Canada, which is in its tenth season so far, saw three spin-offs: Redemption Inc. with Kevin O’Leary, The Big Decision with Arlene Dickinson and Jim Treliving, and most recently Next Gen Den. Redemption Inc., which only had one season in 2012, show-cased an elimination-style competition between 10 ex-cons, from cocaine dealers to fraud artists, with the winner receiving $100,000 seed money from O’Leary to start up her own business.23 The Big Decision is based on the British series Gerry’s Big Decision. The two dragons give advice - and in some cases funding - to struggling Canadian businesses.24 The show stopped after two seasons in 2012. The most recent spin-off is Next Gen Den, “a tech and start-up focused spin-off of the show, available to be watched each Monday via CBC’s website,”25 which premiered in February 2015. The U.K.’s Dragons’ Den sports by far the largest number of spin-offs and special episodes.29 These include Dragons’ Den: Where Are They Now?, a companion format reviewing some of the show’s success and failure stories. Outside the Den covers the personal lives of the dragons while The Best of Dragons’ Den features the best and worst pitches from the past series, including some bad pitches that never aired. Dragons’ Den: On Tour was a 2009 mini-series of five episodes that followed the dragons on visits to entrepreneurs who had pitched on the show, also including some that did not receive an investment. Dragons’ Den: Online was a special, online version of the show, where entrepreneurs pitched to two dragons via online video. A special junior edition Junior Dragons’ Den featured youngsters pitching ideas for money exclusively for Children in Need. The Survival Guide introduced ten different ways for entrepreneurs to impress the dragons. Around the World covers different versions of the show broadcast around the world, including the original Japanese version. Dragons Give Back sees the dragons’ helping to convert a dilapidated community centre in a South London estate into a high-tech children’s facility. In Celebrity Dragons’ Den U.K. celebrities pitched their ideas to the dragons for charity donations while in Come Dine with the Dragons, a special edition of Come Dine with Me, the winner donates £20,000 to charity. In The Apprentice Meets Dragons’ Den, Alan Sugar pitches in the Den looking for an investment in his latest project, again for charity. The Christmas Dragons’ Den saw entrepreneurs pitching seasonal ideas, such as Christmas decorations, gifts, film experiences, etc. In Top Gear in Dragons’ Den, presenter Jeremy Clarkson pitched for investment into his P45, a ‘car suit’ that is designed to be the smallest roadworthy car in the history of motoring. Video 1. The Apprentice meets Dragon’s Den. Go to the online version of this article to watch the video. Regarding co-branding the most essential observation is that every dragon, shark, lion, or tiger is in fact a brand, a person brand. These person brands are being nurtured in the interest of both the broadcaster and the ‘dragon.’ “For instance, while each of the ‘dragons’ to contribute to the series over the years have had previous business careers (as without this they lack the credibility that is vital to their image on the show), none had any particular public or political profile. This quickly changed following their involvement in the BBC series, although this is in part dependent on their own individual interests in developing this aspect of their business identity.”30 In order to fulfil extensive branding roles dragons are handpicked successful local entrepreneurs who represent character or personality traits highly valued in the local culture and also cover a range of product and service areas, e.g., retailing, franchising, finance, and manufacturing. In Germany and the U.S. very prominent ‘teleshopping queens’ are on the panels. Video 2. Presentation by Barbara Corcoran at Google. Go to the online version of this article to watch the video. Video 3. Presentation by Kevin O’Leary at the Mendoza College of Business. Go to the online version of this article to watch the video. Dragons’ Den Canada is presented by Canada Post67 while KPMG, Rosen Clothing, and Wildeboer Legal Consultants appear as sponsors on the CBC Dragons’ Den website68. This is a rather unusual setting for a public service broadcaster. This paper has studied the branding practices around local versions of the Dragons’ Den format in the U.K., U.S., Canada, and Germany. In the U.K. and Canada, the programme is broadcast on the public broadcaster, whereas the German and American versions are broadcast on private stations. Further investigation reveals a number of differences across these countries. Regarding brand extensions, our findings show that the most notable extensions are format spin-offs. Contrary to the expectation that successful formats would see a large number and variety of derived formats, this is only the case for the U.K. version; in the other countries, there are either no or very few extensions. Dragons’ Den U.K. however, covers almost every imaginable variant, ranging from a regular companion format to single episodes for special occasions or with special people. Many of the special episodes are fundraisers for charity. As a public-service broadcaster, the BBC has a special responsibility in covering content ranges, catering for niche audiences, and capturing relevant shifts in society. Hence, an extensive coverage of and involvement in national or important societal events coincides with the BBC’s role as a public-service broadcaster and explains the large variety of charity-related special episodes of Dragons’ Den. Since the beginning of the new millennium, the BBC started to incorporate more business themes into its programmes to address growing interest in this area, in particular by younger audiences.69 Formats such as The Apprentice or Dragons’ Den offer a combination of a (partial) representation of the complex world of business and commerce and entertainment70 while also bearing some educational merit.71 Against this background, it is interesting that the BBC’s Dragons’ Den is the only version of the show that we studied that had a host. A host provides additional explanations to viewers. Likewise, the specialty spin-offs for young viewers can be seen as part of a brand communication that frames the Dragons’ Den brand in the U.K. as an educational one informing audience members on how to become successful entrepreneurs. Branding outside of the Den depends on the individual activities of the dragons and their aspiration towards additional TV presence and prominence and thus differs between dragons. Two cases seem particularly noteworthy. Peter Jones from the U.K. version founded his own TV production company, which produced other business and entrepreneur-related formats. Daymond John from the U.S. version owns consultancy businesses that use the word ‘shark’ in their names. It is intriguing that there is little information available on the exact contractual nature of this branding relationship. Dragons are not only strategic investors in businesses and their products, but can also open doors, e.g., to suitable retailers. This is most obvious for the ‘Queens of QVC,’ but all dragons possess skills that make them particularly suitable partners for certain products. Dragons also act as business mentors and as such, they once again bear an educational role that is fed back into programmes such as Beyond the Tank or After the Den. Our exploratory case study suggests that product co-branding is more common for dragons in private broadcasters’ adaptations. However, only two seasons of the German version were broadcast at the time of this study, so it may be too early to draw conclusions. Additional research is needed that incorporates a larger geographical and cultural scope in order to better capture regulatory, political, and economic factors influencing the localization of content (Vertical Barrier Chain). This also includes investigations into industrial roles beyond a format’s local production team (e.g. marketing, PR, celebrity management). Other interesting topics for future research involve an analysis into the special case of Daymond John as well as an examination of the contractual settings among various stakeholders that may influence branding practices in the context of the Dragons’ Den format. Prof. Dr. Sabine Baumann is Professor of Media Management and Economics at Jade University in Wilhelmshaven, Germany. Before rejoining academia she worked for Bertelsmann in various positions, including Director of The Content Management Competence Center. Besides teaching a variety of courses in media and corporate communication management, her current research interests lie in cross-media publishing, media branding, and social media networks. Her recent publications investigate media ownership and finance structures using innovative graph-based methods, media branding and hybrid organisational strategies for media companies. Dr. Ulrike Rohn is Visiting Professor of Media Economics and Management at the Baltic, Film, Media, Arts and Communication School (BFM) at Tallinn University in Estonia where she is also head of the research group on digital creative industries at the Centre of Excellence in Media Innovation and Digital Culture (MEDIT). Ulrike is President of the European Media Management Association (emma), Associate Editor of the Journal of Media Business Studies, and Editorial Board Member for the Baltic Screen and Media Review. Previously, Ulrike was Researcher at the Arcada University in Helsinki (Finland) and the University of Tartu (Estonia). She received her PhD from Friedrich Schiller University in Jena (Germany) with a doctoral thesis on the localization efforts of western media companies in Asia. Her research and teaching includes topics on international media strategies, cross-cultural audience demand, media branding, media business models, social media and the sharing economy.